Noah is still enjoying being in the "regular" school with his friend Donovan, since he has trouble in classes like wood shop and gym. Why is that good? Noah is so brilliant that he often felt like he wasn't learning anything. Now, there are lots of areas in which he can improve. While Noah is embracing new opportunities, Donovan is stressed out. His sister, her military husband, and their infant daughter have all moved in with his parents, so the house is crowded and stressful. When Donovan runs into some of his enemies at the local park, his brother-in-law's dog has a run-in with one of the kids, whose parents get upset and forbid Donovan from ever being in their neighborhood. When Noah has a hair brained schemed that Donovan needs to stop, he ventures forth into the forbidden territory-- and manages to stop a truck from running right into Megan's house! He doesn't want to admit that he was "Superkid" and get into more trouble, so Noah starts taking credit for being the hero. This deflects attention for Donovan but also makes him jealous when he sees the attention that Noah is getting. Some people who know both boys suspect something is not right, as as plans for the governor to present Noah with a medal at a school assembly start to come together, so do the pieces of evidence that will blow the story apart. Can the boys manage to keep their act together long enough so that they can continue to enjoy their school days in peace? 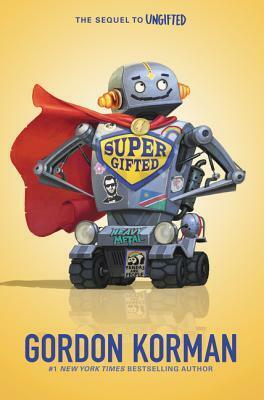 Strengths: I adored Ungifted (2012) and even though I accidentally bought four copies, they are all in tatters, partly because I keep getting it added to Battle of the Books lists! Noah is an interesting character, and I love that he takes up cheerleading. We've had two male cheerleaders at my school, and I think there should be more both in real life and in fiction! Donovan is hysterically harried, and the supporting characters are all well developed and funny. Hard to go wrong with Korman, and this is a worthy, is belated, sequel. Weaknesses: This starts out more slowly than the first book, which shouldn't be an issue for the fans who are eagerly awaiting this title. Sorry to hear about your strep and am glad you're feeling better. Male cheerleaders used to not be unusual at all. Look at old photos and movies with college sports from the 20's--40's--ofte more male than female cheerleaders. My son and I loved Ungifted! I will have to get this one for him. I didn't realize it was a series so we are thrilled to read your review! Thanks so much!